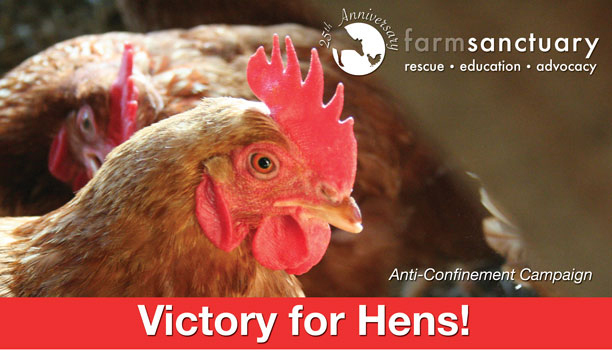 As you know, Farm Sanctuary has led the charge against battery cages for our entire 25 year existence, investigating battery farms, producing reports, testifying before Congress, initiating statewide ballot initiatives to ban battery cages, and calling on you—time and again—to write letters, sign petitions, to donate money, and work on behalf of hens in cages in myriad ways. Thank you. Today, we are thrilled to report that all that hard work has paid off, with a landmark agreement in which the United Egg Producers—the trade group in charge of defending the worst of the worst abuses of farmed animals—has agreed to support federal legislation to protect hens. This is the first federal legislation in U.S. history that protects animals on farms, the first to protect farmed birds, and the first animal welfare legislation affecting farmed animals in more than 30 years. And you made it happen. For that, we can’t thank you enough. Please click here to read more about the legislation, from Farm Sanctuary’s Senior Director for Strategic Initiatives, Bruce Friedrich.